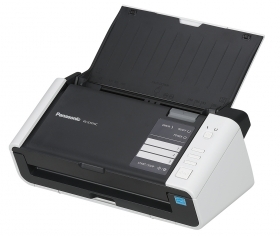 The Panasonic KV-S1015C scanner features a slim and compact body, ideal for small offices / home offices, and offers easy operation with advanced features. KV-S1015C is able to scan at the speed of 20 pages per minute and 40 images per minute in duplex mode. The KV-S1015C is delivered complete with a software solution featuring Biz Card to scan Business Cards and convert the data which they hold into a searchable database and Page Manager to store, organise and edit digital documents produced by the KV-S1015C. Simply press the button and send documents to three pre-registered destinations such as a folder, an email address or a printer.